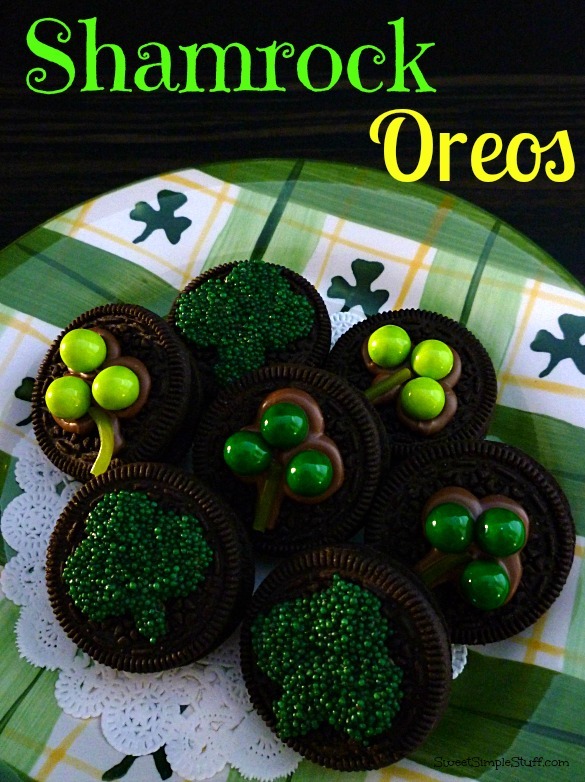 Do you want to make a special treat for St. Patrick’s Day, but don’t want to spend a lot of time? Well, I have got an idea for you! 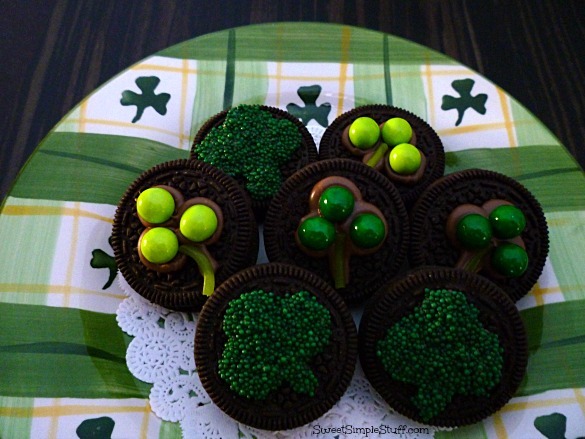 Today I made super some easy decorated cookies with shamrocks! When I say easy … I mean it! This was such a fast project … I couldn’t decide which version I liked best, so I made both! No baking involved … just start with a package of Mint Oreo cookies, use some chocolate candy coating, sprinkles or candy and you have some cute cookies in no time! Mint Oreo cookies were used because they have green filling and I like mint with chocolate … you can use any flavor you like. 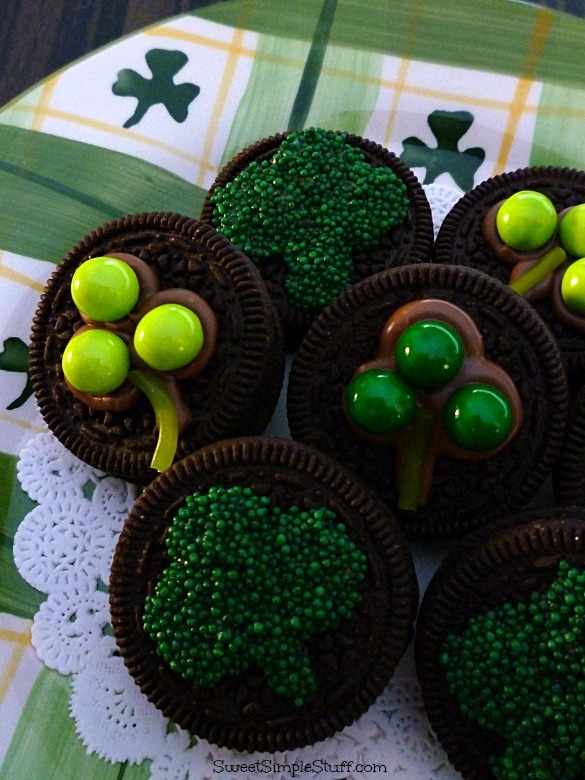 This is just a quick way to fancy up some store-bought cookies for St. Patrick’s Day! Now that I’m looking at the photos … some of my shamrocks remind me broccoli and I’m laughing at them … it’s OK, go ahead and laugh along 😉 Believe when I say … they sure don’t taste like broccoli! Remove cookies from package. Melt candy coating (according to package directions) and place in a squeeze bottle (or ziptop bag with corner cut off). 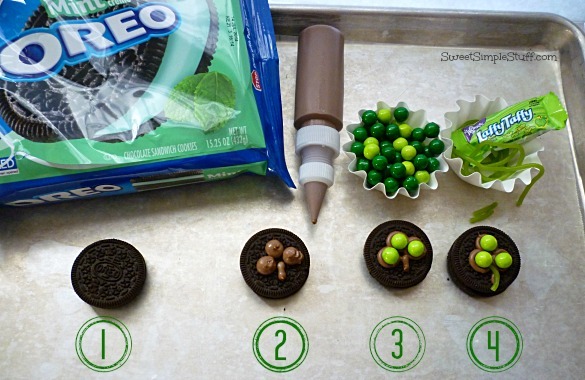 Use melted candy to make 3 dots (in a triangular shape) and draw a stem on Oreo. Place one Sixlet on each dot of chocolate. Put stem in place, let chocolate harden. 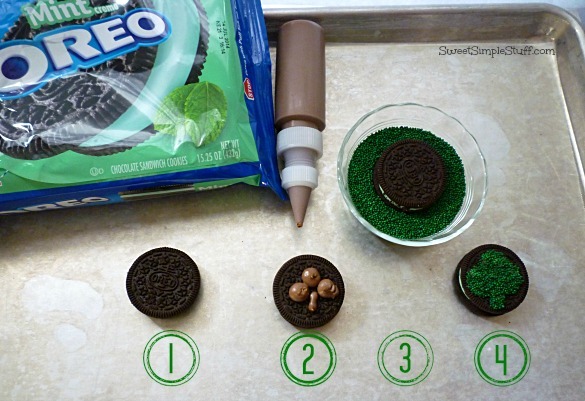 Use melted candy to make 3 dots (in a triangular shape) and draw a stem on Oreo. Note – be careful not to make the dots too large because they will lose some of their shape in the next step. Dip the cookie (melted chocolate side down) in the sprinkles. Awesome looking cookies, right down to your ‘broccoli’ looking ones :} You’re right tho. they couldn’t be easier. 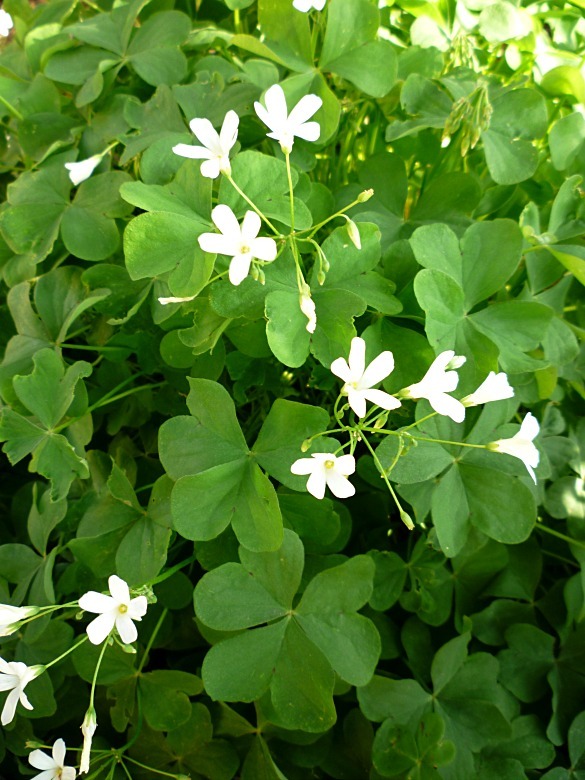 Like your shamrock plant. Looks so dainty like. Thank you Colleen 🙂 My shamrocks may look dainty, but are pretty hardy … dogs, cats, raccoons are always running over them and they come back every year! I absolutely love these! So simple, but so pretty! !